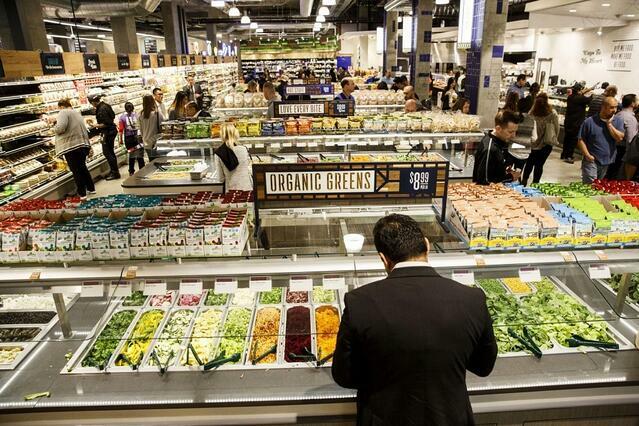 We’re inching closer to the launch of 365 by Whole Foods Market, a new, lower-priced grocery store that the organics giant is betting will help pull it out of a rough patch. Whole Foods has been under siege lately as supermarkets and big-box stores are dedicating more shelf space to organic food, and often doing it at lower prices. With 365, they hope to fight back and broaden that kind of customer they cater to. The first 365 store is slated to open May 25 in the Silver Lake neighborhood of Los Angeles. And the company has offered fresh details on what the new store will look like and how executives will set out to lower prices. Jeff Turnas, president of 365 by Whole Foods Markets, said in an interview that he and his team have “looked and turned over every stone to find efficiencies.” That includes, for example, trying to lay out stores in a way that reduces the time it takes for a worker to get from the stockroom to the shelves. It means thinking carefully about how to create attractive merchandising and displays on the cheap, and creating a uniform store design prototype that can be used across many locations. “We’re not putting as much capital into these stores as we would a traditional Whole Foods,” Turnas said. The new 365 stores hope to have much in common with their sister operation, including high-quality meat and seafood and a sprawling produce department. There are key differences, though, including an emphasis on prepared food bars that Turnas said will be “a little more get-it-yourself, self-serve” than those in a traditional Whole Foods. 365 is also building its stores around a program called Friends of 365, in which it will turn over a small section of its square footage to like-minded retailers to make shopping more of an experience. The Silver Lake store will include a 1,245-square-foot vegan fast-casual restaurant called By Chloe and a 396-square-foot Allegro Coffee Company bar that will serve craft coffee and beer. There will also be a kiosk called TeaBot built by a company of the same name that allows shoppers to create customized tea blends that are served up hot to the user in less than 30 seconds. This is an excerpt from an article posted on WashingtonPost.com. For complete article,click here.